The English word ‘holy’ is derived from the Germanic languages: In Old English, it is hālig and in German heilig. This has connotations of ‘whole’ and the words ‘hale’ and ‘health’ are related. We might consider the English use of the word to refer to the wholeness of the spiritual world linked to the material world – a ‘holy’ person being akin to what the Greeks would call a ‘philosopher’ who understands how God(s) influences the mundane, by virtue of a higher knowledge. The Romans characterised the holy men of the pagan Britons, Gauls, Germans etc as ‘philosophers’ so it is perhaps unsurprising that their Christianised descendants would continue with the Germanic epithet denoting a ‘wholeness’. The Gaelic equivalent word was Naomh – pronounced ‘Neev’ if you are Irish or Scots and ‘Noo’ if you were Manx (who converted the ‘m’ to a ‘w’ sound rather than a ‘v’). This appears to have originated from the word noíb and to have mutated through naem(h) to naomh (source: eDIL online = Electronic Dictionary of the Irish Language- níam(h). The ocean-going currachs of Ireland’s west coast are called naomhóg – presumably because they might carry you to those fabled lustrous western isles where the sun sets: the pagan Atlantic equivalent of heaven, or possibly some far-flung monastery! ‘Saint Patrick’ would be Naomh Padraig… The Old Irish word for heaven was Nem – curiously close to the word for ‘poison’: neim(h) – a paradox which is understandable when you consider the otherworld-inversion principle by which a place (death) to which life flowed and from which it would again be reborn! When discussing the ‘Celtic’ saints, I am referring to the traditions of Christianity’s ‘holy heroes’ originating in Northern Hispania, late sub-Roman Gaul, Brittany, Cornwall, the West and Northwest of Britain, Wales, Ireland, the Isle of Man, Scotland, the Hebrides and the Orkneys. There are a vast number of them and not all have official recognition by the Vatican. They assumed special ‘superhero’ names, as it was the custom of monks to relinquish their birth names and take on a name with specific holy meaning. Some of these names may even have been designed to reflect pagan names or traditions in order to Christianise them in the Theodosius II tradition. This may have been particularly true of the ‘ahistoric’ saints – heroes who existed only in storytelling traditions. Stories about the ‘Celtic’ saints have existed in written form and in oral folklore, and the written stories (known as ‘hagiographies’ or ‘lives’). The earliest accounts would have relied upon the collection of oral testimonies as very few of these persons (where they actually existed at all) left surviving identifiable personal writings, let alone autobiographies. The ‘peri-christianisation’ hagiographies relate largely to saints of the 5th-7th centuries, a period often formerly referred to by historians as the ‘dark ages’ on account of the paucity of surviving written evidence we have from it – many early accounts are copies from much later on. It didn’t help that the ‘Black Gentiles’ (Vikings) freely burnt many of the early Christian records in a futile attempt to stamp out the spiritual ‘invaders’ who had overturned paganism. Many of these lost works probably contained significant details of paganism, now largely lost. The ‘magical’ aspects of hagiography reach their greatest and most fantastical heights in medieval Irish texts. However, it is always worth considering how important the use of allegory was in early Christian expression, so apparently magical occurrences need not be taken literally: For instance, the ‘miracle’ of giving ‘sight’ or ‘light’ to the ‘blind’ is an allegory for conversion to the Christian faith. Magicians ‘rising’ into the air before being discomposed by a saint may be an allegory for the inevitable result of haughty pride. A ‘mute’ being given the power of speech is the conversion of a person who then becomes a preacher. A ‘leper’ is someone who – after the Old Testament sense – is a ‘sinner’ suffering in some worldly way as a result, and their ‘healing’ is the committal of penance or confession of faith. 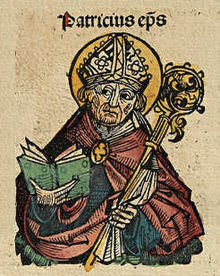 As far as the church as a corporate entity was concerned a saint was a person who displayed divine apostolic holiness, inherited through a direct chain of authority deriving from the ‘commission’ the biblical Jesus passed on to his first disciples, to whom he supposedly gave the same holy powers of healing and converting. The Nicene Creed established a doctrine of Jesus as equivalent to God, rather than just a prophet, thus the chain of disciples following on were believed to display signs of this divine gift. 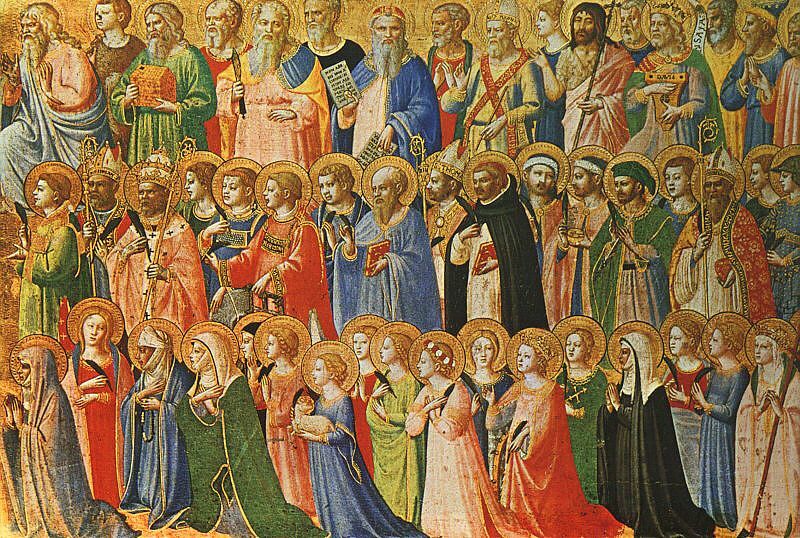 Apostolic sanctity was therefore confirmed by providing evidence of miracles performed by the saint both during their life and after their death. As there is no objective way of proving this, the process depended upon oral and written testimony of persons considered suitably holy and trustworthy, and for this reason the science or art of hagiology and hagiography developed. This allowed a special status to be posthumously granted to the founders of religious institutions and dynasties who served the political and ideological ends of the church. By the sixth century, it may have been apparent that in contemporary time people were not being ‘actually’ raised from the ‘dead’ or cured of ‘blindness’ or ‘leprosy’, but a belief in this power was very strong, and ordinary people were willing to accept stories of what appears to have been the figurative ‘otherworld’ healing in a more literal sense: ‘death’ was paganism, ‘blindness’ was recusancy, and ‘leprosy’ was sin – the marks left upon the body by imperfect living and faith. Early medieval abbeys served several purposes: On one level they were communities designed to reinforce the message of christianity by acting as an exemplary focal point of the religion and source of Christian learning. In early medieval Ireland, they also offered an alternative for young freemen to joining the cultural institution of the Fian, where they would learn traditional hunting, social and fighting skills before re-entering Irish society in their majority. By implication, they might also have had the option to join the hedge-schools of the pagan philosophical/religious scholars referred to in tales as the Draoi otherwise translated as ‘druids’, although by the time of the writing of early law tracts during the Christian period, this had been supplanted by the system of Abbeys. Either which way, Abbeys would provide a form of economic relief and education and – like other courtly institutions – allow the forming of alliances outside of the usual tribal sphere and the chance to interact with others from outside of the tribe. They offered education and opportunities for travel and adventure to young men, and to young women they relieved their parents of the burden of marriage dowries (often cattle); In fact, due to the marriage system referred to as lánamnas comthinchuir (?’marriage of equals’) it also relieved the bridegroom’s family of the burden of donation of land equal in value to the dowry to a bride’s family: celibate monks and nuns were economically independent of their families, yet would still be able to interact and take part in family life and politics. They would bring power and influence without economic outlay, and in a time of polygamous marriages (7th/8thC) could offer a buffer against successional disputes among siblings and step-siblings. So … Abbeys could bring, stability, new contacts, peace and prosperity. To support them further, keeping and maintaining an official memory of their founders would have been essential to their establishment and power. As they expanded their influence to ‘daughter’ houses, the influence of the patron saint and his/her stories would expand to a wider geographical area and fix the importance of the parent house in the emerging Christian kingdoms of the early medieval period. This would ensure the wider propagation of the hagiography, which would support central canonisation through the Vatican. Hagiography gave historicity and power to the claims of the secular leaders who were responsible for introducing and promoting christianity in their districts, or of offering overt material support to an institution in their territories. They were, after all, allying themselves to the international power of the Church and its secular ‘Holy’ Empire (Rome and Byzantium). In Ireland, the Saints of the ‘first’ and ‘second’ waves of historical Christianisation were almost invariably (except for Patrick) the close relatives of the secular leaders. Given the dynastic and tribal nature of early medieval society in Ireland and its allied cultural territories, power with provenance was generated by sponsoring abbeys and the expensive task of writing books which effectively ‘fixed’ a version of history in the official schema. As the orature of pagan learning and power was supplanted by the written word, so there was a shift of authority to the literary medium (albeit probably still supervised by the traditional keepers of law, lore and history who had converted and learned to write under church supervision). There is good evidence that early hagiographies were often rewritten to suit the claim of successive dynasties, and this process may be repeated a number of times across the centuries. This is why hagiographies do not make good historical sources. Being a religion founded on the hegemonic leanings of some far-off desert tribes coupled to a lot of figurative Greek philosophy, Christianity had little to tell people of Atlantic Europe about how their world worked. Where it did work was in the circles of secular leaders who admired hegemonic power, and in the spiritually-bereft, consumerised multi-cultural wastelands of the collapsed western Roman Empire, where a longing for healing and future glory amidst an apparent landscape beset with disease, decay and barbarity inspired people to take up their leaders’ new religion. In such an atmosphere of cognitive dissonance, people will latch on to anything with the appearance of a cohesive paradigm and christianity was just that. The decay of paganism had started earlier with Romanisation, and the process had started earlier within the Roman culture due to ambitious over-assimilation of some very carefully crafted religious philosophies of the ‘Golden’ or ‘Bronze Age’. The Byzantine Roman Emperor Theodosius II enacted laws in 439AD establishing Christianity as the state religion, and stipulating how paganism was to be officially replaced – by converting its holy sites and festivals to Christian purpose. The expense and cultural resistance to destroying all of these and starting afresh was too great to do otherwise. Armed with this principle, missionaries took up the spirit of this and sought to perfect it in the furthest reaches of Rome’s former western empire. Culturally, such ‘barbarian’ regions were based on a tribal model, although with Christianisation came the concept of hegemonic Kingship which was to progressively erode this. These tribal cultures were illiterate, agricultural and warlike, and therefore had a rich and highly sophisticated narrative tradition dealing with survival skills, interpretation of the natural environment, and the tales of heroes and genealogies of tribal leaders. To fit into this culture, it became necessary to fit Christians into this form of narrative: Historical stories of why the tribe was successful and why their environment was formed the way it was could be replaced by tales of saints! These could either be invented or embellished upon the memories of real persons who acted in the christianising process. By forming a literary tradition, the oral culture could be influenced by a more persistent and less evolutionary (and therefore potentially devolutionary) propaganda. Christianity was, after all, a wholly consumerist religion! For this reason, the hagiographies of Celtic saints are some of the most fantastical and amusing of any in the Christian world, far outstripping the New Testament antics of their Apostolic anticedents, including Jesus himself! Paganism itself was an empirical reaction of a pre-literate culture to the science and philosophy of the natural world, expressed in the arts of story, song, performance and practice.